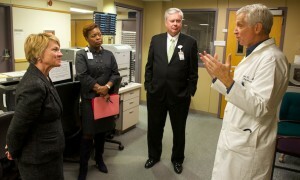 His days start early and often begin out in the community sharing the message, and the mission, of Akron Children’s. This morning he spoke at a 7 o’clock rotary meeting in Hudson about the hospital’s 125th anniversary and how the hospital continues to position itself for the future. “We learn a lot from the kids we take care of and that feedback is extremely valuable,” Considine said. His daily schedule is typed out on 5 x 7 notecards, which he keeps tucked in his breast pocket for quick reference – a refreshingly old-school approach you don’t often see in the age of iPhones and iPads. 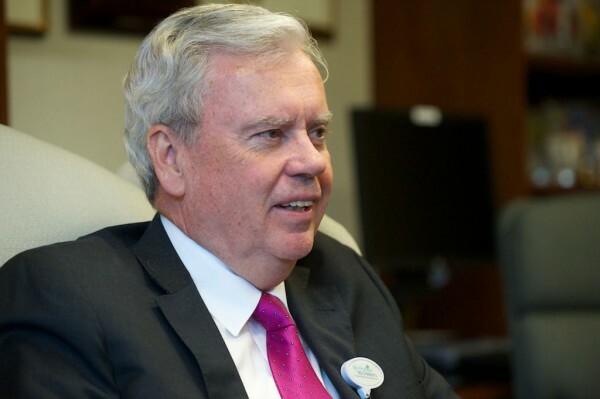 O’Desky knows how important it is to Mr. Considine to interface with patients, families and employees as much as he can, and she takes advantage of scheduling his meetings around campus when possible. After an 8:30 a.m. strategic operations committee meeting to talk about the investment the hospital wants to make in research, Considine chats by phone with the president of the Ohio Association of Children’s Hospitals about Issue 3 (Ohio’s marijuana legalization initiative). 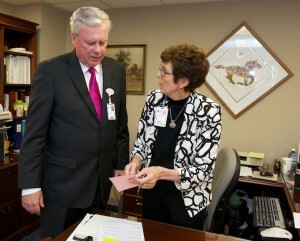 At 10:30 a.m. Bernett Williams, the hospital’s vice president of external affairs, arrives in his office to review his role in a Partnership Conversation panel meeting being held at the hospital. The impetus was a conversation in Schwartz Rounds that highlighted a complex abuse case involving multiple agencies. 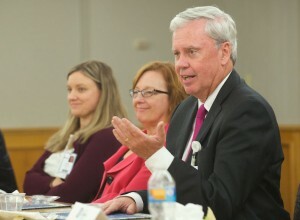 Williams explained how the conversation brought to light the hospital’s need to have ongoing communication with organizations like Ohio Department of Job and Family Services and the Children’s Services Board. If you ask Considine how his leadership role has evolved after 36 years as CEO, he’ll tell you he now sees himself as more of a coach and mentor to the people around him. 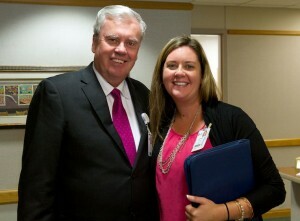 Upon arriving at a welcome lunch for new physicians, Considine makes it a point to approach and greet each new doctor. After going around the table and allowing everyone to introduce themselves, he provides a short history lesson on the hospital and how its geographic footprint has changed over the years. When asked by a new doctor about the challenges Akron Children’s faces in the future, Considine references the ever-changing healthcare financing and reimbursement issues, the challenges of growth without sacrificing culture, and the explosion of “mega” hospital systems. Considine mentions the guiding principles made back in 1890 by the founders of Akron Children’s: treating every child as your own, treating everyone as you want to be treated, and promising to never turn a child away. “We have what we have today based on those humble promises,” he said. With lunch wrapping up, Considine walks over to see the HR department’s new office space in the AMHA building. He’s greeted warmly by department employees and even gets a hug from daughter, Cathryn O’Malley, who serves as the administrative director for organizational effectiveness. They chat about the success of some recent hiring fairs Children’s has held on campus. 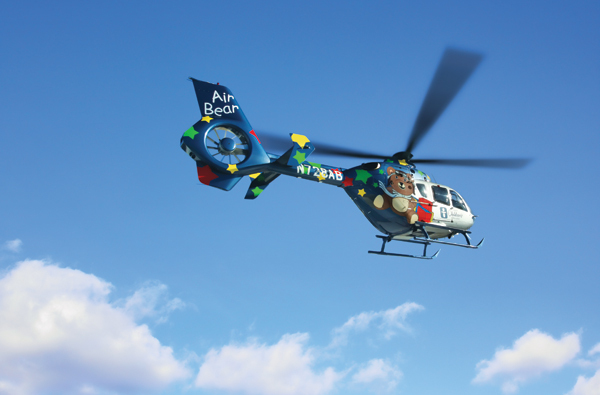 As he heads back to his office, he stops to watch Air Bear land on the helipad – a sight he has seen numerous times, yet one that still seems to inspire a sense of awe and reverence. It’s likely a reminder of just how far things have come. Considine credits his faith for directing his life’s work, his humble beginnings for his work ethic, and his parents, Howard and Gene, as his key role models. A blue “Howie Strong” bracelet on his left wrist keeps the spirit of his recently deceased father close at heart and hand. For all intents and purposes the life of a CEO is a 24/7 job – literally. Considine credits Becky, his wife of 43 years, with a happy home life and 3 well-adjusted children, which afforded him the luxury of pouring his heart and soul into his work. Now an empty nester with 3 grown children, he’s less conflicted about his work-life balance – but that wasn’t always the case. “When Cathryn was in either kindergarten or 1st grade her teacher told Mrs. Considine she was sorry to hear about her and Mr. C. breaking up,” O’Desky shared. “Becky was very surprised and asked where she heard that news. The teacher said Cathryn mentioned he didn’t live at home. Long before he was a CEO, Considine shoveled sidewalks, painted homes, mowed grass, unloaded trucks, worked in the tire pit at Goodrich, and peddled newspapers – all jobs he says helped to shape his work ethic. One of his vivid memories as a newspaper boy, with a route on Main Street, was frequent stops at a local drugstore for a cold Norka-brand orange soda – ironically the same company his son Michael now owns and operates. When asked about his future plans for retirement – the waters are still unchartered – but he says he sees himself always having a home in Akron. Considine is involved in a number of community service projects, including building houses for Habitat for Humanity. 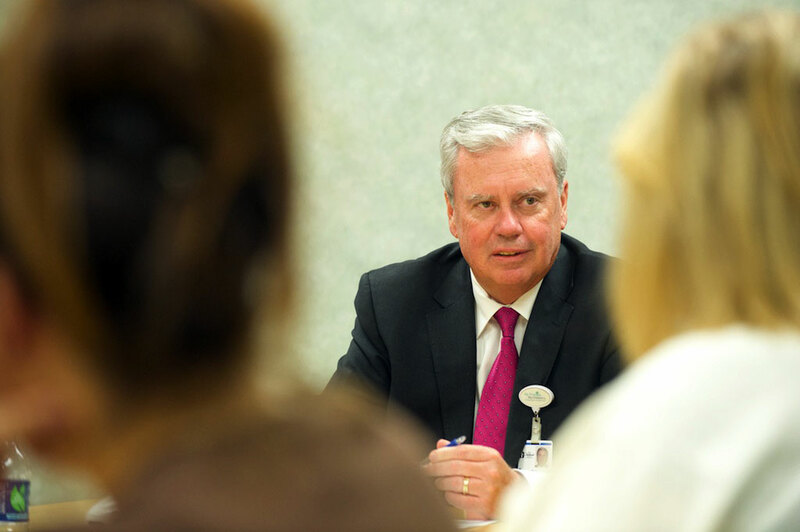 At 2:30 p.m. Considine meets up with Walt Schwoeble, vice president of human resources, for this month’s employee roundtable. Each month 12 to 15 randomly selected employees are invited to join him for an employee-directed session aimed at allowing them to ask questions and share what’s on their minds. Today’s hour-long meeting focused on the challenges of growing the hospital while maintaining quality, how the census plays into staffing issues and turnover, and the hospital’s long-term needs. Once back in his office he takes a minute to reflect on the framed sun catcher resting on his windowsill. It was given to him by a former patient’s mom and it’s something he deeply cherishes. “Angie was a 13-year-old girl with cancer who took advantage of our art therapy program and was known for making sun catchers for the doctors and nurses,” he said. “She was an inspiration, made people’s lives better and along the way became a caregiver herself. With his tenure still ongoing, one could argue that his own legacy – while vast – is not yet complete. He then needed to get ready for an evening dinner meeting – a typical full day advocating for the Akron Children’s Hospital mission.